This soon-to-be-famous 11 year-old WhizKid creates videos. His name is Aiden. He lives in Canada. He adds new videos to his three YouTube channels every Saturday. This kid rocks! His top video, “How to make Slime” has had 2.4 million+ views. This month, JuniorTube (not affiliated with YouTube) partnered with an inaugural group of creators of videos made for kids two to 12 years-old. Aiden is one of a select bunch featured in the launch JuniorTube Originals, an ad-free, subscription-based service for families, featuring videos by and for kids ages two to 12. 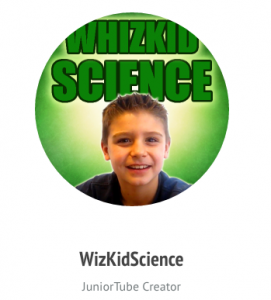 And he’s also got a CafePress swag page where you can buy WhizKid Science t-shirts, book bags, iPad cases and lunch bags. So, hey, what were you doing when you were 11 years old?